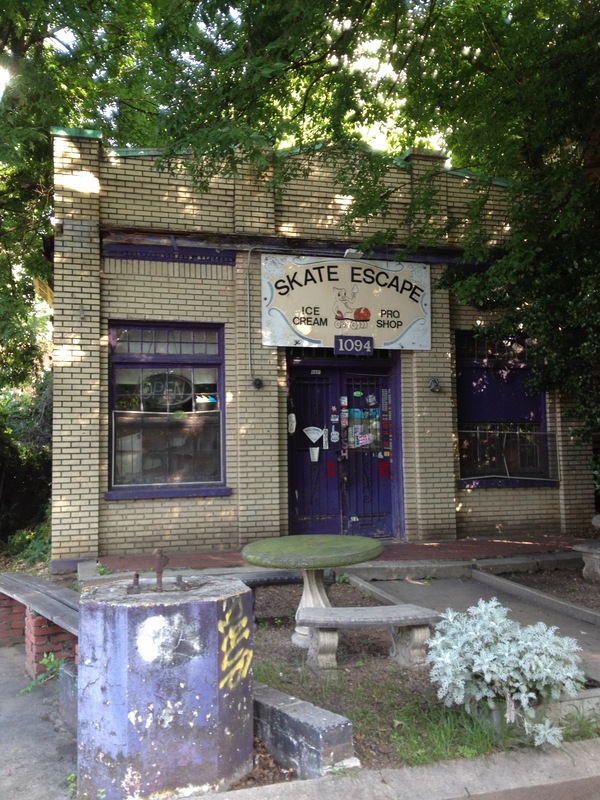 Across Piedmont Avenue from the 12th Street entrance to Piedmont Park in Midtown Atlanta, it’s impossible to ignore Skate Escape. 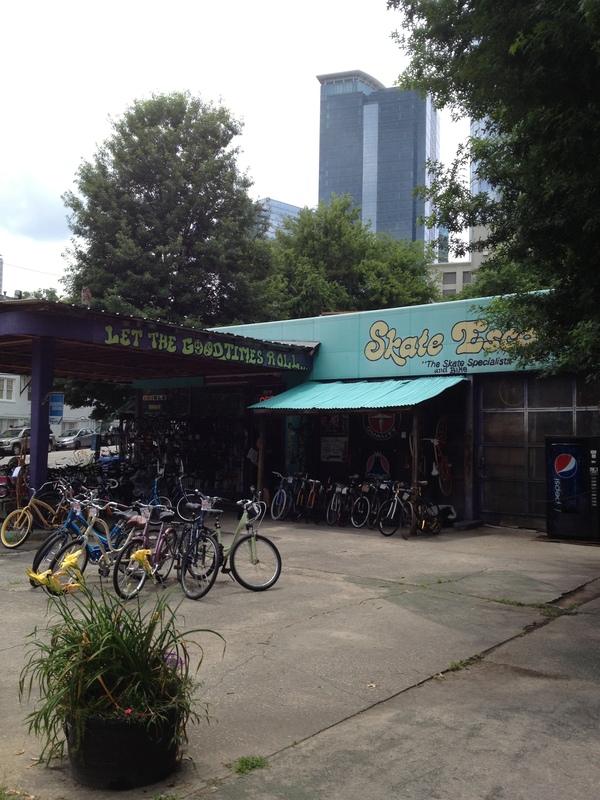 From their corner the parking lot of bicycles, brightly-colored buildings and yellow signs beckon park visitors to come purchase, maintenance or rent roller skates, inline skates or bicycles. It’s a prime location for a business that rents and sells wheels, which owners Janice Phillips and Bob Orlowski have been doing successfully since 1979. 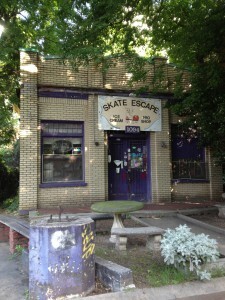 The most obvious Skate Escape building (there are two) is the former service station, which sits right on the northwest corner of Piedmont and 12th Avenue. 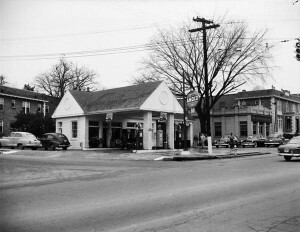 This building (1086 Piedmont) was built in 1948 as a service station and now holds Skate Escape’s bicycle repair shop and bicycle sales center. “It was vacant for six or seven years before we moved in,” Janice Phillips, owner of Skate Escape, says of the former service station building. They own this building, purchasing it in early 1981. 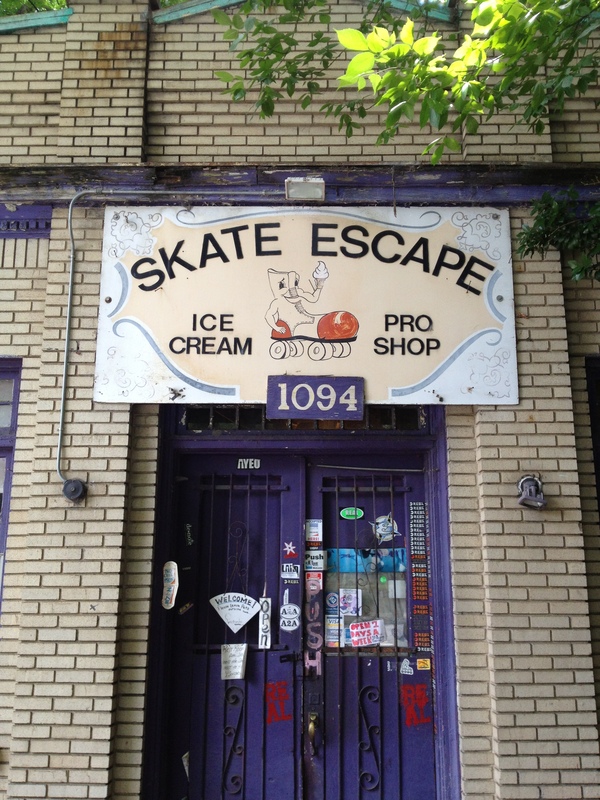 While the former service station attracts attention, certainly the hidden gem of the corner is 1094 Piedmont Avenue, the roller skate and skateboard building that also sells ice cream. It sits north of the service station building, partially hidden from Piedmont traffic by the leaves of overhanging tree branches. Atlanta city records indicate this stocky brick building was built in 1900. 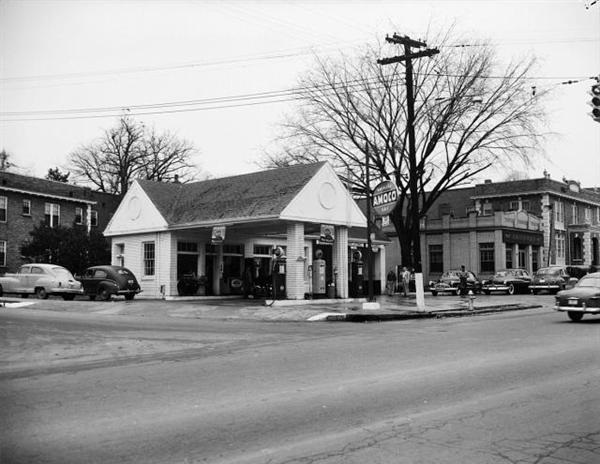 Dr. Albert Evans of Atlanta (Evans is deceased, but a company he created currently owns the building) purchased this property from Lloyd Redd and Joe Baldwin on May 14, 1963. The Skate Escape business brings its own story to the history of Atlanta, which started as a roller skate shop with rental and sales, along with skateboards and ice cream. From her corner Janice Phillips has witnessed the rise of roller skating, inline skating and skateboarding, as well as the resurgence of the Midtown neighborhood. Back in 1979 they picked Atlanta to be closer to the Masters. 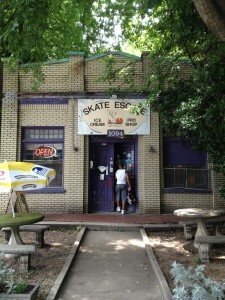 Ironically the Masters occurs in April, which happens to be Skate Escapes’ most busiest time. “Because of this Bob hasn’t been to the Masters in more than 34 years,” Phillips says with a chuckle. Today custom roller skates are quite popular, and Skate Escape creates most of these custom roller skates for Atlanta’s roller girls. 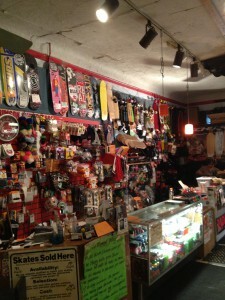 The most diehard customers bring in their own shoes, typically military style boots, and have Skate Escape attach the skates. Why military boots? This form of footwear is similar to manufactured roller skating boots – military boots have soles that are solid and reinforced along with many layers of leather just like roller skate shoes, so some customers prefer them. 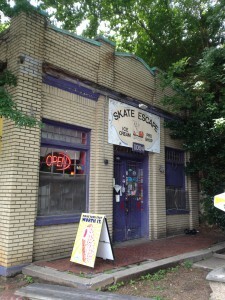 Skate Escape is located at 1086 Piedmont Avenue, Atlanta. 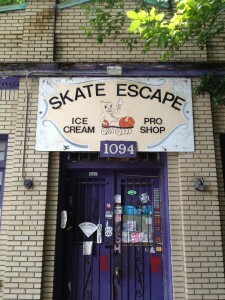 You can visit the Skate Escape website, email them at skateescape@hotmail.com or call them at 404.892.1292. 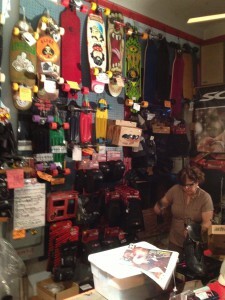 They open at 11 a.m. and close at 7 p.m. for anyone looking for professional-level rink roller skates, basic outdoor roller skates, inline skates, skateboards, longboards and bicycles. 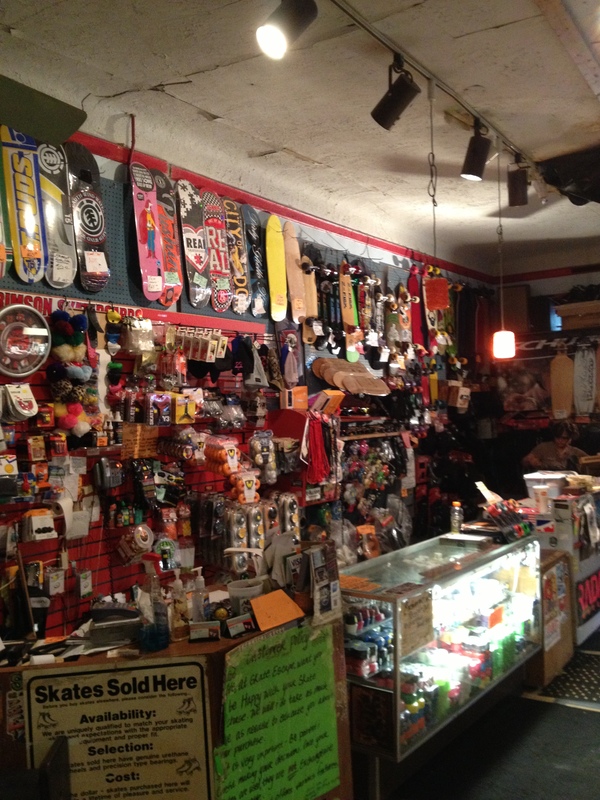 The skate, skateboard and bicycle repair shops are also open during these business hours. Did you know? Nobody knows who made the first skateboard. It was probably California surfers in the 1940’s and 1950’s who invented the first skateboards from roller skates and pieces of wood. Did you know? The upward bends on each end of the skateboard are known as the kicktails and they make tricks such as the ollie and kickflip possible. Did you know? Larry Stevenson, founder of MAKAHA skateboards, hosted the first skateboarding contest in 1963 and invented the double kicktail in 1969. Did you know? The first roller skate was an inline skate patented in 1760 by Belgian inventor John Joseph Merlin. Did you know? Rollerskating failed to become popular in the public realm until James Plimpton patented his rocking skate design (the quad design you see today) in 1863. Plimpton built many of the first roller skating rinks. Did you know? The first verified bicycle invention was by a German subject under the Grand Duke of Baden, Baron Karl von Drais who invented a “running machine” (called a Laufmaschine in German) in 1817. Did you know? With two wheels, handles and a basic frame but no traditional steering, pedals or gears, the “running machine” invented by Drais was extremely hard to turn and was powered by… running. Did you know? The first bicycles were known as a velocipedes, dandy horses and hobby-horses.